The second annual Live at Squamish music festival kicks off in about 48 hours as thousands prepare for good times in a field and a fun-filled schedule of music and activities. Whether you’re camping out, staying in Squamish or Whistler, or just heading up for a day, the festival should have something for you. From DJ’s and dancing to food truck eats and open air rock. The full schedule was recently released as well as a special treat for Friday in case any keeners want to get a preview of the grounds. Spots are all sold out but if you booked camping, the grounds open at 12:00pm. Sound Check Party from 6:00pm to 8:00pm with The Matinée, My!Gay!Husband! and Kuba Oms and the Velvet Revolution. The first 1,000 people to show up will get in and you don’t even need a Live at Squamish ticket to attend this preview. The beer garden will also be open at this time. Box office opens at 10:00am each day. You can download a free festival guide for on-site information this weekend or download the free iPhone app. 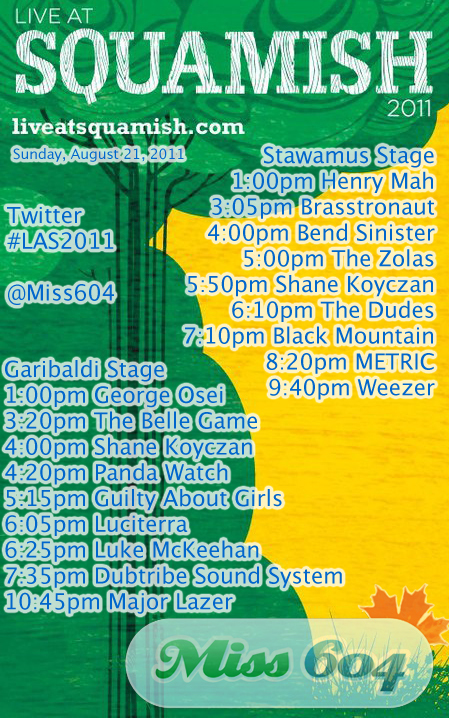 Follow the Twitter tag #LAS2011 or @LiveatSquamish for instant updates. Some quick tips: Do bring a blanket, your own picnic (no bigger than a lunchbox), water (in a container no more than 1.5 litres), a camera (just not professional size if you’re not accredited media) and a smile and your dancin’ shoes. Do not bring chairs, BBQ’s frisbees, umbrellas, all the regular pointy/dangerous weaponry type stuff, laser pointers, fireworks and the like. There are in-and-out privileges and pass-holders will get wrist-bands for the weekend. The site is also smoke free. If you haven’t secured on-site parking then you can park in downtown Squamish and take the free shuttle to the festival off Cleveland Ave. There is also a free bike valet for those who cycle in. Tickets are still available for $89 (single day, purchased before Friday) and $19 (weekend passes, purchased before Friday at midnight). Prices go up to $110 (single day) and $190 (weekend) after the Friday night deadline. 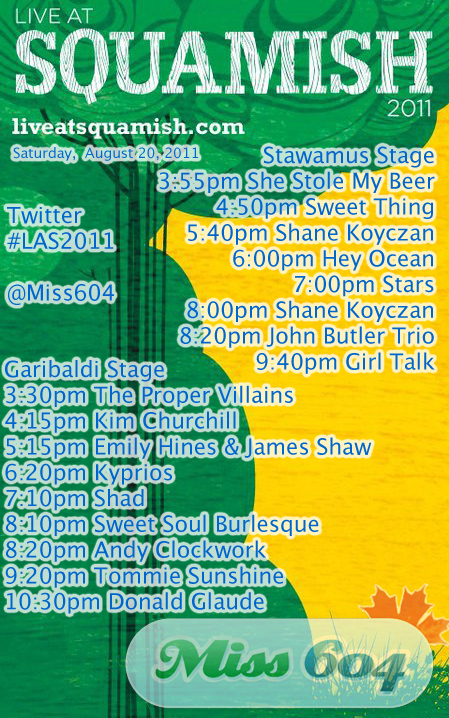 Miss604.com is a proud Media Sponsor of Live at Squamish 2011. Update Whistler Water wants to give you 2 VIP passes for the weekend. To enter just leave a comment here or post the following on Twitter: “RT to enter to win VIP @LiveatSquamish tickets from @WhistlerWater #LAS2011 http://ow.ly/678bL“. They’ll draw a winner tomorrow at 10:00am. Must be 19 years of age or older to enter and win the VIP passes. Good luck! Update In case you missed the first day (Saturday) at Live at Squamish I have a recap posted here. I would love to go to Live at Squamish again this year!! 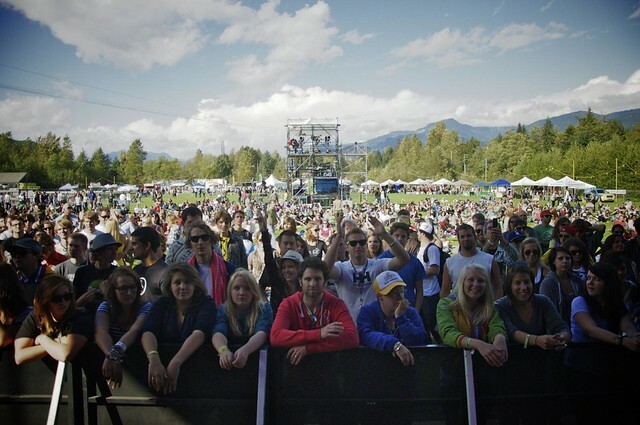 good music in two days-Squamish 2011! Since we missed last year – this would be great to do. Awesome! I live for good times in a field! Pick me!! I would loooooove to go!! VIP sounds nice. Please pick me. Would love to join friends that are already going! Great line-up of talent again this year. It will be the concert of the summer. Forecasts say the weather will cooperate too. It just doesn’t get any better than that. Haven’t been to Squamish in awhile. I would love to go to squamish for the festival. Please please please and thank you. Live At Squamish = Awesome..